In the past couple of years, we have all grown accustomed to President Trump’s rude and outright disrespectful treatment of individuals he doesn’t see eye to eye with, and sometimes, he takes it too far. One prime example of this is the President’s constant attacks on the late Senator and prisoner of war, John McCain. While McCain did represent the Republican Party as a Senator from Arizona, he did not always support Trump’s policy decisions or his juvenile representation of the presidency of the United States. McCain’s disapproval led to some serious tension between himself and the President, tension that Trump is clearly still consumed by today. Trump’s most recent tirade against McCain came two days after the anniversary of McCain’s release from a North Vietnamese prison camp. In a tweet posted by the President on March 17, he writes about McCain apparently being “last in his class” and working with Democrats to expose a “fake dossier” days before the 2016 election. The same day, Trump retweeted a tweet by Lori Hendry where she wrote “we hated” McCain because of his vote against repealing Obamacare. There is no evidence that McCain shared the Steele dossier prior to the 2016 election, and while he did finish toward the bottom of his class at the U.S. Naval Academy, he did not finish last. It’s also worth noting that McCain was honest about his academic career, while President Trump has threatened his high school and college against releasing his transcripts, according to Michael Cohen. 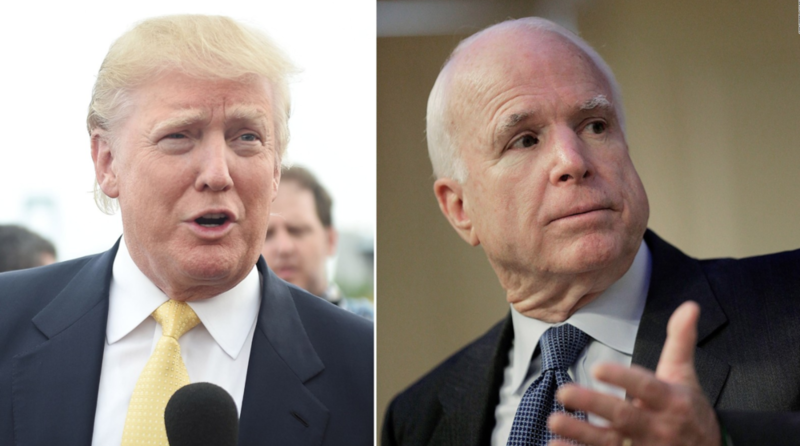 One of Trump’s most widely circulated attacks on McCain came in 2015, when he told a reporter, “He’s not a war hero. He’s a war hero because he was captured. I like people who weren't captured.” McCain was a Prisoner of War for nearly six years and refused an early release until all of his fellow soldiers had also been released. He received a Silver Star, three Bronze Stars, and a Distinguished Flying Cross for his bravery in the Vietnam War. If the military record of John McCain does not constitute a war hero, I would love to know what will. Let us also not forget that while McCain was serving in the Vietnam War, Trump was dodging the draft because of supposed bone spurs. Put aside all of the politics, all of the disagreements on policy and character; no person, particularly the President of the United States, should be trashing John McCain. Attacking a deceased man, who not only served in Congress for over 36 years but was also a war hero, is beneath any human being, and especially beneath the occupant of the highest office in the land. Lawmakers across the country, regardless of political affiliation, should be readily denouncing these insensible attacks on John McCain. This is not a partisan issue, this is an issue of human decency and respect — neither of which our President seems to possess.